With the holiday season quickly approaching pet owners, both vacation and family bound, have to start thinking of their beloved furry friend’s needs. Even a few days away from home can cause unnecessary stress for both your home and your pet’s safety considering the possible festive decorations hung and left around the house. The decision to board your pet is not one to be taken lightly, their physical and mental health being of the utmost importance. By doing your research and finding a reputable, sanitary, and immaculately run facility, such as Big Times Kennel, you can provide your pet with a safe alternative holiday experience. You may think that your pet will be okay left alone at home if you put out extra food and water and ask your neighbor to stop by twice a day, but this is sadly not the case. Many pets become accustomed to having people in the house and become very stressed when they are suddenly left alone for multiple days. Boarding your pet ensures that all of their needs will be addressed by trained, professional staff who love animals. Make sure they are receiving the affection they require and that all their physical needs are being met by employing professionals who provide comfort and care for a living. During the holiday season especially, the things in your home may actually be dangerous for your pets if they were to get into them. Undigestible materials are laying around more frequently than any other time of year such as garland, glass and plastic ornaments, and human food prepared for holiday celebrations. These types of items can cause intestinal and other health problems that can go undetected until it’s too late. 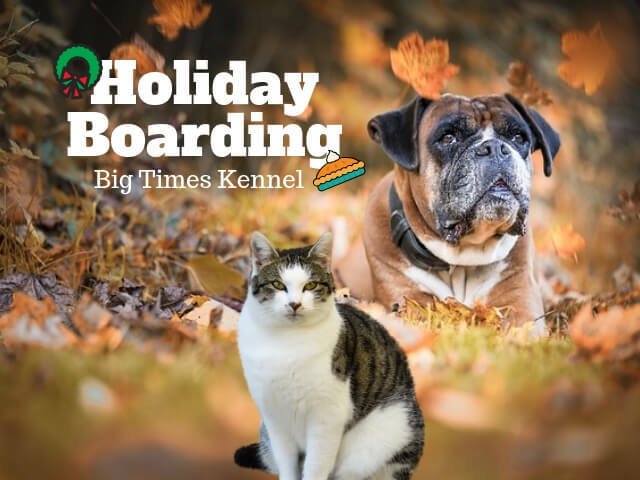 Big Times Kennel boards both cats and dogs. Co-owners John and Maureen are life-long pet lovers and owners offering your precious dog or cat a safe, clean, and comfortable home away from home. Visit their website today at www.bigtimeskennel.com or call 937-885-3427 for more information. They also offer pet daycare and grooming, as well as obedience and agility training.